"When he came down from the mountain, great crowds followed him;and behold, a leper came up to him and knelt before him saying, 'Lord if you will, you can make me clean.' And he stretched out his hand and touched him, saying, I will; be clean.' And immediately his leprosy was cleansed. And Jesus said to him, 'See that you say nothing to any one but go, show yourself to the priest, and offer the gift that Moses commanded, for a proof to the people.' "
You can't make this stuff up. Faith healer Benny Hinn was admitted to a hospital in California where he was treated for shortness of breath cause by atrial fibrillation. According to the official statement issued by Benny Hinn Ministries, this is a condition from which he has "experienced intermittently for over 20 years." It may be safely said that I have a deep and abiding skepticism when it comes to televangelists. 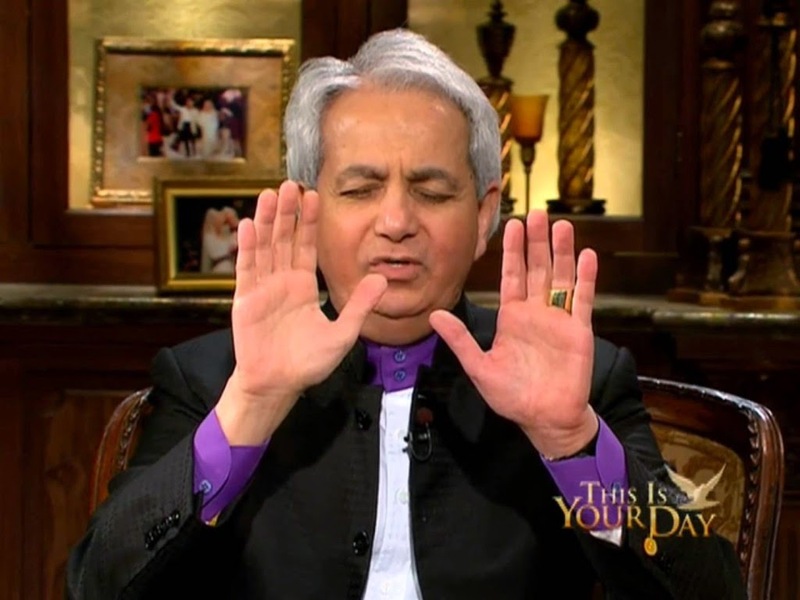 That skepticism goes into the red zone when it comes to faith healers such as Benny Hinn. Especially when they resort to conventional medicine for their own care despite making an extravagant living allegedly casting out all manner of disease entities from the gullible and the desperate. When I was younger and had more time on my hands, I used to watch Hinn and Oral Roberts in action. And once, stuck in a hotel room outside Tulsa while a torrential thunderstorm railed outside my window, I saw Oral's son Richard implore a caller to the show to touch his hand to the TV screen in order that afflicted victim might be delivered from his sinus infection. As far as I can tell, although this is not a scientific conclusion, if I may use such a phrase given the subject matter of today's post, faith healers tend to specialize in casting out discrete disease entities such as cancers, heart disease, paralysis and such. I don't think that dropping into a Benny Hinn healing service with a severed artery or a gunshot wound would be the smart play. Which brings me back to Hinn condescending to earthly medical care for what appears to be a chronic medical condition. What's Pastor Benny doing with a chronic medical problem? Atrial fib is just the kinda invisible medical problem that is right in his wheelhouse. You would think that he could just cure himself on the house. Which leads me to another question? Does Pastor Benny have medical insurance? If so why? OK. Am I making too much of this? Or at the very least having way too much fun? Maybe so. Maybe no. But then again my rather paltry net worth is not dependent upon convincing the weak minded to part with their money. And make no mistake about it. Showbiz preaching and healing have been really good to Pastor Hinn whose net worth is said to be around 42 million bucks. I'm no Biblical scholar but I know a thing or two. The passage of Scripture cited above where Jesus heals the leper speaks to me in the context of fee-for-services faith healing charlatans like Benny Hinn for the following reason. According to the law of Moses, lepers were impure and could only be cleansed by the temple pursuant to an elaborate and costly ritual. Here, Jesus not only heals the poor man, he also tells him to show himself to the Priest, to show the religious authorities that Jesus has bypassed the system and he did so for free. A more blatant attack on the legitimacy of the Temple and the Priesthood cannot be imagined. Indeed, nowhere in the Bible is Jesus depicted as requiring payment or a "love offering" before he performed any of the miracles attributed to Him. But that was then. This is now. Jesus's base of operations was largely confined to the sticks of Galilee. Until he went to Jerusalem He was strictly local. He didn't have to fool with satellite, shortwave and cable outlets. He didn't have to manage real estate. Jesus may have been the Messiah but he wasn't a celebrity. The latter can't really be done on the cheap. So get well soon Pastor Benny. And be sure to take your beta-blockers. I have been struck down by a sinus infection and pleurisy which is having an adverse impact on my otherwise sunny disposition and steel trap mental acuity. Busy weekend and the sun is shining. 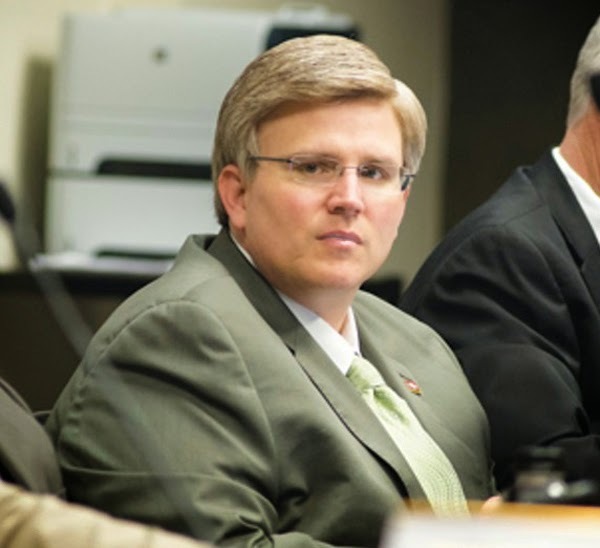 For those of you outside the State of Arkansas, or without Internet access, this is State Representative Justin Harris of West Fork, Arkansas which is up in Northwest Arkansas. He is a Tea Party Republican and he and his wife own a Christian day-care center up there that is heavily subsidized by Arkansas Department of Human Services to the tune of about 800 grand a year depending on what you read. He is also in the big middle of one the tragic stories I've ever heard. Tragic in the sense that a small child was sexually assaulted while legally in the custody of he and his wife after they gave she and her sister to another family to care for. The practice is called "rehoming." It is one that I had never heard of before the Arkansas Times broke this incredible story. Basically, rehoming is when an adoptive or custodial parent gives a child or children to someone else to raise. As you might imagine, not all adoptions work out. Rather than trying to work through DHS at these times some folks just basically give the kid to someone else who wants him. The new parents take the kid in without having to go through all the background checks and home visits that the law requires. Indeed, there are websites where people can find kids that adoptive parents want to get rid of. I have read that it is not unheard of for pedophiles to frequent these sites. Obviously the practice of rehoming is a recipe for trouble of the worst sort. And trouble of the worst sort, the most sickening and heartbreaking sort, is precisely what happened here. You can read the original Arkansas Times piece here: http://www.arktimes.com/arkansas/a-child-left-unprotected/Content?oid=3691164 . I will give Gentle Reader the Reader's Digest condensed version. Rep. Harris and his wife, who were already the parents of 3 boys adopted the two girls in question. (They had adopted another girl which they subsequently prevailed upon DHS to take back.) The girls came from a background of abuse which is sadly not unheard of in the juvenile court system. It is common for parents who adopt difficult cases to receive a subsidy from the State as an incentive to adopt problem kids. According to what I have read the subsidy is to help defray the additional costs engendered by these children. The girls in question had been diagnosed with Reactive Attachment Disorder or RAD. I have reasonably unfettered access to psychiatrists, which I concede I should probably take better advantage of, and they assure me that this is a real disorder. It is characterized by a failure of the child to bond with the new parents and can manifest itself in acting out behavior and even violence. Representative Harris received a legal monthly subsidy for this reason. For whatever reason, things did not go well. The long and the short of it is that Harris wanted DHS to take the kids back. It is unclear as to what happened at that juncture. Harris says they threatened him with a charge of abandonment. DHS will not confirm or deny this allegation because the adoption process throughout is veiled in secrecy. And properly so. Enter trouble of the worst sort. Rebuffed, so he says, by DHS, Harris sought to rehome the girls with a man named Eric Francis and his wife, who had adopted children through a foreign agency. Mr. Francis (who for God's sake should not be confused for 5 minutes with the local journalist of the same name) had worked briefly for Harris at the day care center owned by him until he was terminated for excessive absenteeism. Mrs. Francis-or the former Mrs. Francis I should say for reasons that will become clear shortly-was said to be friends with Mrs. Harris. However we got to this juncture is murky. But this much is agreed on. DHS knew nothing about Harris rehoming the girls with the Francis family. Harris kept receiving the subsidy checks despite no longer having the girls in his care. And Eric Francis raped one of the little girls for which he is now pulling 40 years. I spent my career chasing down money and getting it back for the government. Government money comes with strings. The recipient has to dot every i and cross every t. Or as the old SCOTUS case I always cited said "men must cut square corners" when they do business with the government. And thus we come to the easy part of the case against Mr. Harris. In a subsequent news conference, Harris claimed that he can prove that he gave the subsidy checks to Mr. Francis. Doesn't matter. The subsidies in question were for the specific use of Mr. Harris for the care of the girls based on his having satisfied exceedingly stringent conditions precedent. Mr. Francis was no more entitled to those checks than I was. Harris had no authority to disburse that money in any fashion other than what the law allowed. Further, once he rehomed the girls how on Earth was he still an eligible payee? In the interview he defended the decision to rehome the girls with Francis-a man that he had terminated from his day care center-because he had a "pristine" police record, one which we may candidly state is now decidedly less pristine. Doesn't matter. First of all, it was not Justin Harris's call to make. That authority is vested in DHS. Secondly, a clean police record is not the standard for adoption. In the past 18 months or so, I have passed 2 police background checks and hold a VIRTUS certification from the Roman Catholic Diocese of Little Rock. My record with the cops is as pristine as Mr. Francis's was. This just means that I am a fit candidate for taking pictures for Girls On The Run and for yelling at guys at Catholic High. It does not mean that sending a kid to live with me is in the best interests of a particular kid. No matter how great a guy I am or how much I love the kid. The best interests of the kid is the standard. Not lack of a criminal record or what is in the best interests of Justin Harris. So you may ask why wouldn't an elected official work within a system he took an oath to uphold? Good question. Harris is a powerful guy. Why did he jump through all these hoops when he could just threaten to defund DHS and haul the Director in for a browbeating? Why didn't he hire a lawyer to challenge the threat to charge him with child abandonment? If indeed one was made. There is the likely Tea Party reflexive response that he wasn't gonna let some pointy headed government bureaucrat dictate how he was going to run his family. So he took matters into his hand as a sovereign citizen or the other foolishness I have seen in my day. As for me, it has always been my practice to try to work with the folks that give me money. But then again I don't have much of a sense of entitlement. But here's my theory, speaking of the money. It's all about the money. And not the subsidy checks. That's chump change. I'm guessing that a DHS finding that Harris had abandoned the kids, if upheld, would adversely impact his license to-duh- run a daycare. Which you and me are pretty much subsidizing. So for this reason he decided to game the system that was jamming him up. Which resulted in a child getting raped. Rehoming is not illegal in Arkansas. But it may soon be. A bill was introduced the other day that would make it so. Governor Hutchinson says he is concerned about this issue. Former Governor Beebe says he never heard of rehoming until he was leaving office. I fully believe both men. I fully believe that what happened was a failure of a system that allowed Harris to adopt these kids in the first place. I fully believe that Justin Harris is sick unto death about what happened to that girl. I fully believe that he would have never knowingly placed that child in harm's way. That is the only undeniable truth he has uttered about this whole sordid transaction. I also fully believe that his response to this is firestorm reveals him to be a gold plated narcissist. He, and he alone, is completely responsible for what happened to that child. He neglected a child in his custody. It resulted in her being violated at the tender age of 6. She is the only victim here. Which leads me to the next question. What the hell does it take to get a day care license revoked in this state anyway? As statistics go it hasn't been a bad winter. In fact, if one were to sit down and look at the data, one would probably find that the winter 2014-2015 was one of the milder on record. And I know that I have played a good bit of golf in December and January. But to hell with data. February has been brutal. As I type this my Weatherbug app informs me that it is 26 degrees on the other side of the wall. I am beyond sick of this bitterly cold weather. I made this observation at a luncheon following a Lenten service over to the neighborhood branch of the Baptists. Father Erik, who had given the homily, reminded me of the fact that this Winter has been mild up until now. 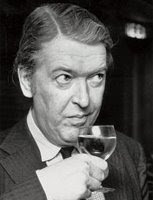 I'm not one to rebuke the clergy but I have become even more cantankerous in my old age. I wasn't going to take this layin' down just because this observation was coming from a guy wearing a collar. "Oh yeah?," I said, trying to be helpful. "I wrecked my car on some black ice Tuesday night. I've had water running for 2 weeks. I can't play golf and I'm tired of being housebound and eating my own cookin'. Forgive me but I've just about had it." Father's expression was quite tranquil seeing as how he was sitting next to a madman. "I'm sorry about your car," he said. "Spring will be here soon." I don't know if it is a function of my advancing age but I really long for Spring. I used to like Spring mainly because it heralded the beginning of baseball season. And there is still something reassuring that the Cubs will be yet again toiling away in the friendly confines of Wrigley in the service of utter futility. But I need to hear the birds, to see grass grow, feel the sun on my face. I want to spend hours out on the deck. I want to sit on the porch, play golf, and to take long walks. This latter consideration is particularly acute seeing as how I now have a hiker in my life and I am not keen on being told by her to go take one by my lonesome. But today it is 26. The clouds are positively leaden. Tomorrow the Little Rock Marathon will take place. They are predicting a high in the forties with a 60% chance of rain. Ugh. I'm sorry. But that just doesn't sound like fun. But there is no chance of snow. The temps will get above freezing. Father Erik is right. Spring will be here soon.